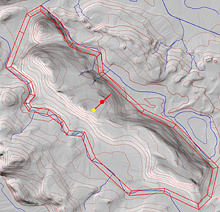 Photoshop allows for the selective correction of grey values or to combine multiple shaded relief images created with differing illumination direction. This is a rather tedious, but currently the only viable method. 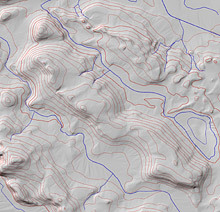 An alternative is the use of software specifically designed to apply local adaptations to a shaded relief as shown below. Local adjustment of the light direction. Left: A mountain ridge illuminated from the northwest. Right: A fence containing locally adjusted illumination from the southwest. The images below compare a manual shading with an analytical shading that employs locally adjusted light direction and brightness parameters. Analytical shading with local adjustments.